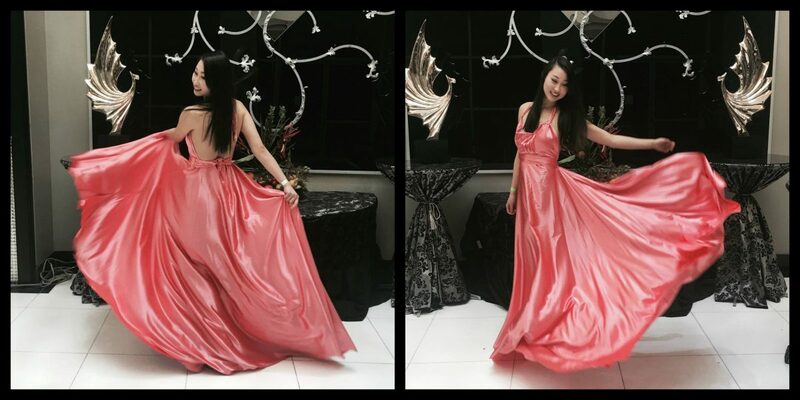 Alice models a hand sewn evening dress that she designed and made herself. Now let’s get right into it: I went around today to the University of Toronto, where young fashion is always thriving with sparks. I know that for myself, attending the University of Toronto gave me the opportunity to explore my sense of style and meet like-minded people. That’s why I decided it would be a good location to look for our it-girl of the day! Meet Pamela, who is a student studying genetics and biology. She literally caught my eye from a mile away – she’s got that confidence and it-factor to her walk. When I saw her, she was just making her way across campus on Toronto’s Hoskin Avenue. It was close to Trinity College, one of the University’s well-known historic buildings. I chatted with Pamela for a few minutes to get to know her and find out more about her style. She is already an inspiration to me for keeping up her wardrobe during class! Managing school, jobs, and looking great all at once is definitely not easy. 😛 Let’s get the inside scoop on what she’s wearing! Pamela is pulling off a black spandex bodysuit from Urban Outfitters ($29). It looks perfect for summer – something I can definitely see myself wearing. It matches so well with her hair! Both her light-wash jeans ($29) and leather shoes are from Urban Planet ($39). The rain-drop shaped earrings are from Ardenes ($8) and adds a nice touch to finish off her look. If you saw them in person, you would’ve seen in the intricate diamond design on these fabulous earrings! Pamela is from Toronto, and these are pieces you could find at almost any mall in the area! I loved this look especially because she kept it simple yet stylish. I noticed the trend in the black colours she had going on, which made her jeans really pop. You never want to put too many distractions together in one look, and Pamela balanced this out perfectly! Plus, she pulled everything off on an affordable budget! Alice models her own fashion, a hand-sewn black evening dress at Metro Convention Centre. Do You Have Street Chic? Are you street chic? Make sure to use the hashtag #streetchic and join in on this new state of mind! Street Chic is looking for inspirational fashion all over the country. Toronto has many areas that are hot spots for fashion! One of the most well-known area is Queen west, where lots of cute little stores line up down the street and give this city new dimensions. If you ask me, I would argue that Toronto’s financial district is also buzzing with style. I always see guys sporting suits with personality and girls in their best heels. Next time, we will move our search there for our next street fashion inspiration! Wouldn’t you also agree that office fashion is really becoming the trend lately? Stay tuned with our official blog, as lots of posts are on the way! Show us the best street fashion from your town, city, or province! Thanks very much for your lovely blog, I can feel your talent, passion, love for people and life. Great job! Alice! Thank you Lily for your kind words! Happy to contribute an article! Very unique design and pretty talent young lady!